Since we are in the thick of winter squash season I was not very surprised to see this beautiful butternut squash nestled in our most recent CSA box. But I was pleased. Butternut squash has a delicious-sounding name that is definitely earned by the sweet, slightly nutty flavor of its abundant bright yellow-orange flesh. 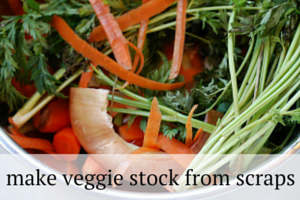 Its thick skin makes it hearty enough to last quite a while - weeks or even months - after being picked. Since I knew I had some time before it would go bad, I pondered a few different recipe possibilities (soup, stuffed squash, roasted squash, etc.) for a while before I hit on my favorite idea -- ravioli! I had made ravioli from scratch only once before after taking an excellent pasta-making class with my friend, Naushon, at Ramekins cooking school in Sonoma. Luckily for me, Naushon was eager to test out her skills since pasta-making is way more fun with two or more people. Best of all, she was also willing to host the pasta-making party at her place --the big, sunny, wooden farm table in her apartment is perfect for projects like this. 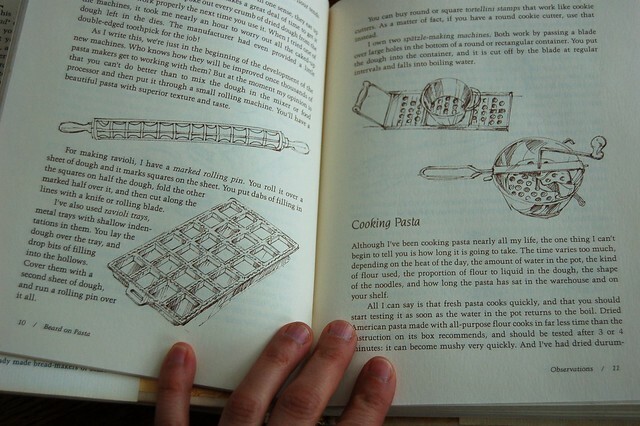 Naushon and I sweated (literally) and laughed our way through the process of making the Basic Egg Pasta recipe from the wonderfully detailed, lovingly written and illustrated copy of Beard On Pasta my mom gave me a few years back. Several hours later, we feasted our eyes on the fruits of our labor--a double batch of homemade butternut squash ravioli. 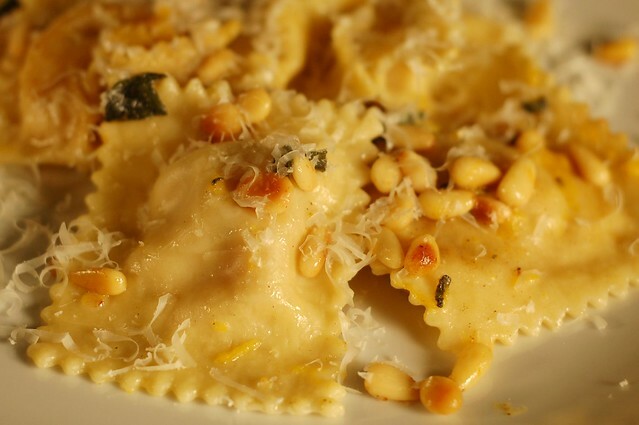 I chose a simple preparation for them -- a browned butter sauce with fresh sage, pine nuts and Parmesan. In case you'd like to try, here is a little pictorial tutorial of the process. 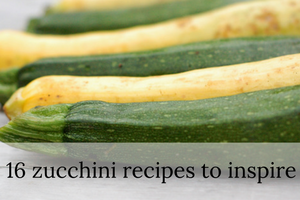 Following the pictorial are recipes for the filling and the pasta that include exact amounts for each ingredient and a list of the equipment you'll need. Buon appetito! Preheat the oven to 375. 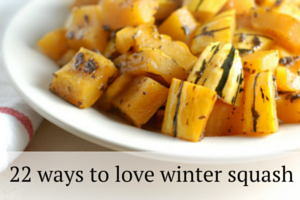 Cut the squash in half length-wise and scoop out all the seeds and stringy bits. Rub the flesh with olive oil and place cut side down on a heavy cookie sheet. Roast for 30-40 minutes, until fully soft. While the squash is roasting, cut up the onion or shallot and sautee in olive oil or butter until translucent, stir in the crushed dried sage. 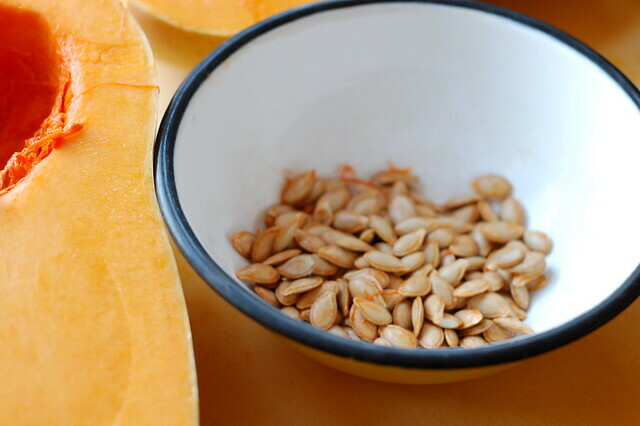 Once the squash is done and has cooled down enough to handle, scoop the flesh out of the skin and place in a bowl. 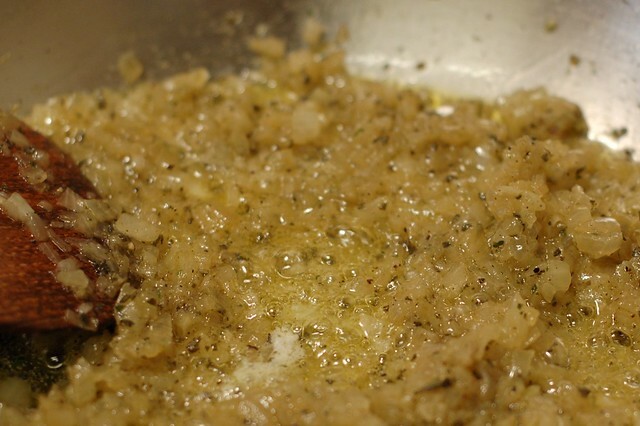 Add the sauteed shallot or onion mixture, 1/2 cup of grated parmesan cheese (you could skip this if you want to make the ravioli dairy-free), and 1/2 tsp of nutmeg, stir well to combine, then season to taste with sea salt and black pepper. I recommend doing this step one or more days in advance, just leave the filling well-covered in the fridge until you're ready to fill those little pasta pillows. I like to mix the dough on cookie sheets as I have limited counter space and it's also much easier to clean a cookie sheet than it is to get egg and flour out of tile grout or wood. 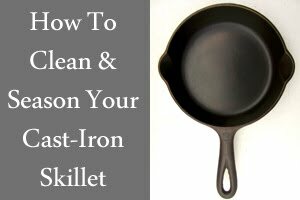 Start by pouring the flour onto the tray, gathering it into a pile, adding the salt, and forming a well in the middle of the flour. Crack the eggs into the well. 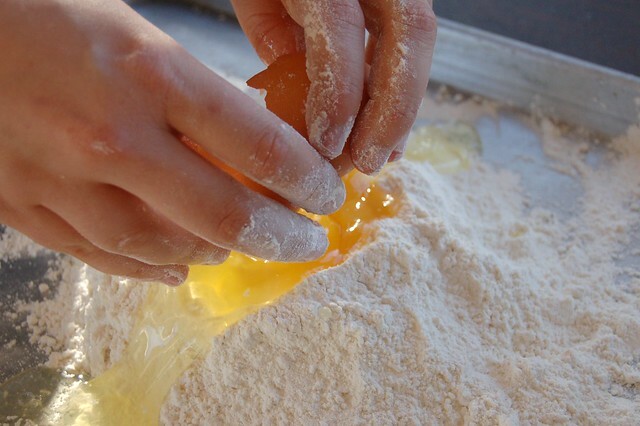 Incorporate the egg into the flour with a fork. Once the fork tines get clogged, clean them off and begin using your fingers to do the same thing until it's all mixed together, roughly. 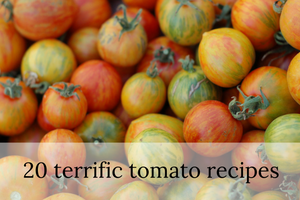 If you're having a lot of trouble with it (though remember that it should be stiff), you can add a little bit of either olive oil or water to help it stick together. 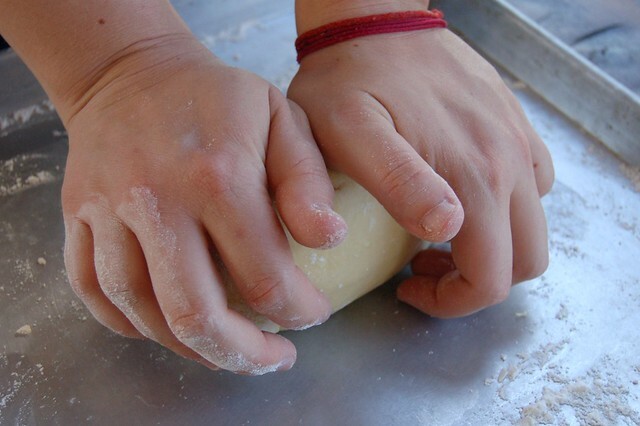 Once the dough begins to stick together, form it into a ball (it will seem to be composed of flakes of dough - that is normal). Now it is time to knead. 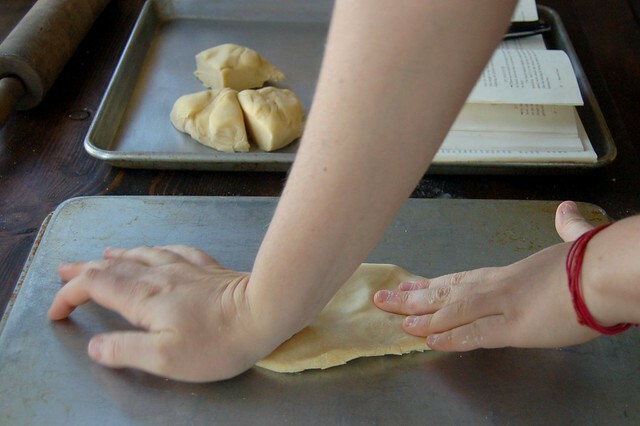 Use the heel of your hand to push the dough away from you, then fold the flap back towards you and give it a quarter turn. Press down on another section of the dough and do the same thing. The dough will be stiff-textured (much more so than bread dough) and hard to work with. Knead it for 10 minutes (this is where the sweating comes in) or until the dough is smooth. 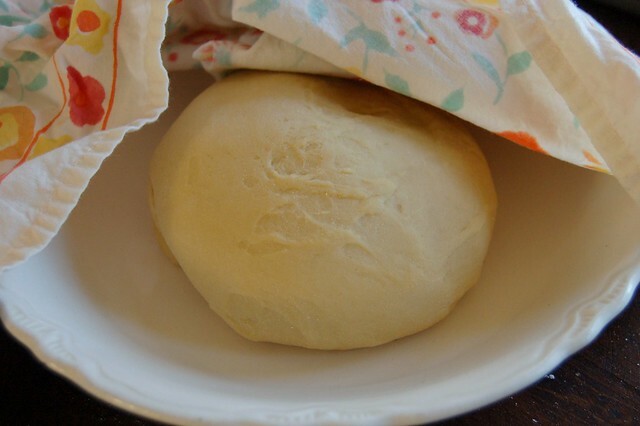 Then pat the dough into a neat ball, cover it with a dish towel or sheet of plastic wrap and let it rest for at least 30 minutes (1-2 hours is even better.) It may not sound important but you must not skip this step -- it's crucial! By this point, YOU will also probably need a little rest, as well as a chance to clean up a bit to get ready for the next step. After the dough has rested long enough (it should be more pliant and easier to work with after its little nap), cut the ball of dough into four pieces. Put three back under the towel or plastic wrap so they don't dry out and flatten the fourth one with your palm or a rolling pin. 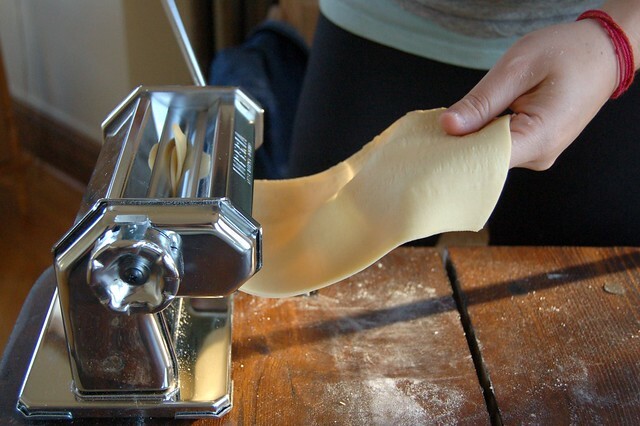 We used my beautiful, little Imperia pasta roller (a gift from my brother a couple of years ago) for the first time! Clamp the pasta roller to the edge of a table and set the machine so that its rollers are at their widest setting. Feed the flattened ball of dough through the rollers a few times, folding it over each time before you push it through. 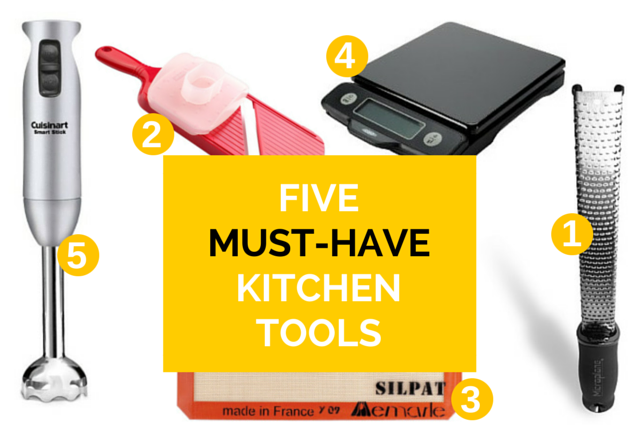 This will help further knead and smooth the dough. Don't freak out if the edges are rough or torn or if the dough is not perfect (it probably won't be). You can patch it or fold it over and put it through again to even it out. 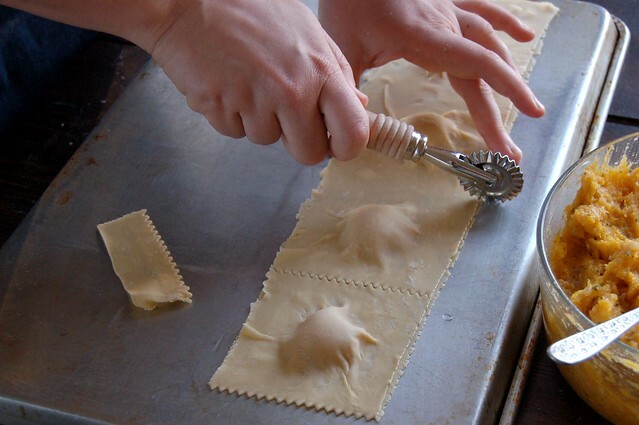 You will also end up trimming the edges once you're ready to cut the ravioli out so the edges need not be perfect. Lay the rolled out ribbon of dough on kitchen towels or on a floured (or semolina-ed) cookie sheet to rest for 5 minutes. Do not let it get too dry, though. 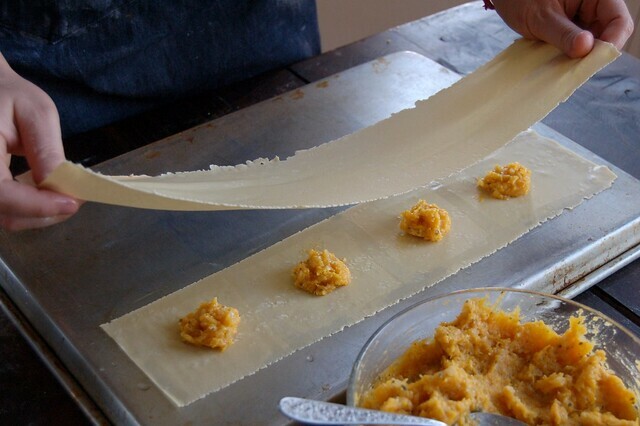 You may also need to cut it into two or more pieces in order to fit it on a cookie sheet or towel at this point -- just make sure to match them up in size when you're making those cuts since you will very shortly be using one as the top of your ravioli and one as the bottom. 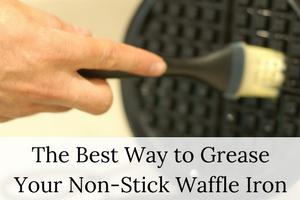 Place your bowl of filling at a convenient spot and make sure you have a small spoon handy. Position your cookie sheet (which should be lightly covered with either flour or semolina to prevent the dough from sticking to it) in front of you and get to work. 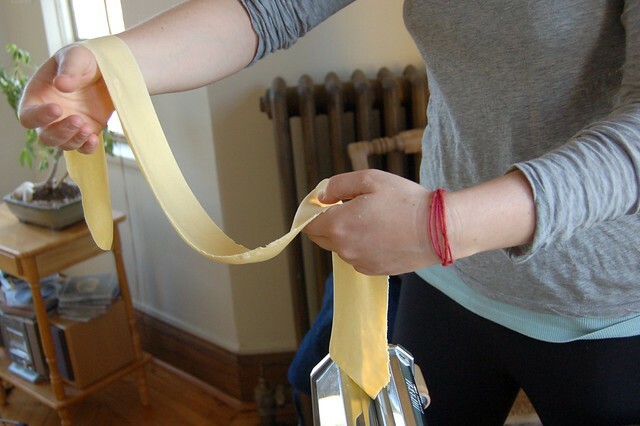 Lay two roughly equal-sized ribbons of rolled pasta dough on the sheet length-wise. If one is larger, make that one the bottom sheet. Using the spoon, place a dollop of filling at equally-spaced intervals along the bottom ribbon of dough. If the ribbon is tall enough, you should be able to fit two rows of filling on it, if not, just go for one. Be careful not to add too much filling or to place the dollops too close to each other or too close to the edge of the ribbon of dough since you will need adequate space to seal each one and then cut it apart from the others. Once your drops of filling are in place, dip either your finger or a pastry brush (I used my finger) into the bowl of water and wet a grid pattern around each dollop of filling. It is essential to wet the dough thoroughly (though you don't want puddles of water or to make it soggy) around each drop of filling as this is what will make the seal between the bottom and top pieces of dough. 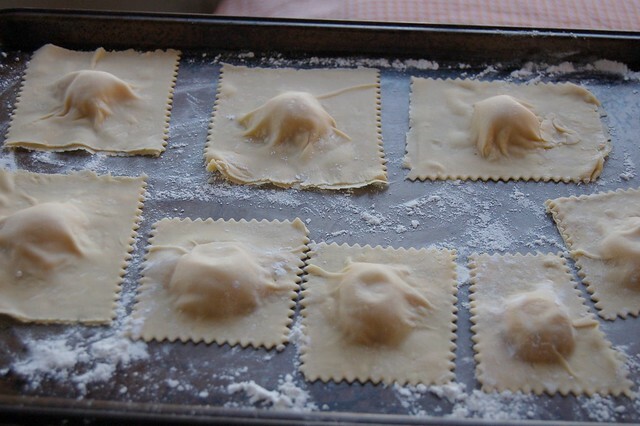 An incomplete seal will make a ravioli that is much more likely to explode in the pot while cooking. Once you've finished moistening the bottom ribbon of dough, lift the top piece of dough and position it over the bottom, taking care to match them up as well as you can. I think this part is the most fun of all! 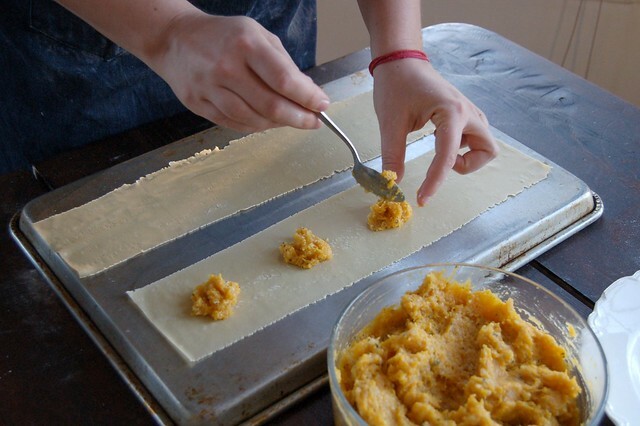 Using your ravioli cutter (you can also use a regular paring knife, the only difference is that the cutter will make those trademark fluted ravioli edges), cut carefully down the middle of each row in both directions to separate them. 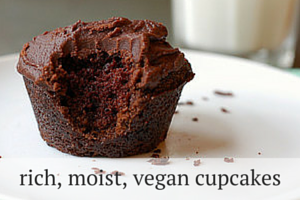 Be sure to leave equal room on each side and avoid cutting too close to the filling. Place the cut ravioli on another cookie tray that is lightly dusted with semolina so that they do not stick. You can also stack them in layers on pieces of lightly floured parchment paper if you have too many to lay out on the cookie sheets. Ravioli freeze well so I strongly suggest making enough to freeze as this is a pretty time-consuming process and it's nice to have something more than one meal's worth of food to show for it at the end. Just lay the ravioli flat on cookie sheets and place them in the freezer for a few hours, then scoop them up and store them in ziplock bags in the freezer until you're ready to use them. 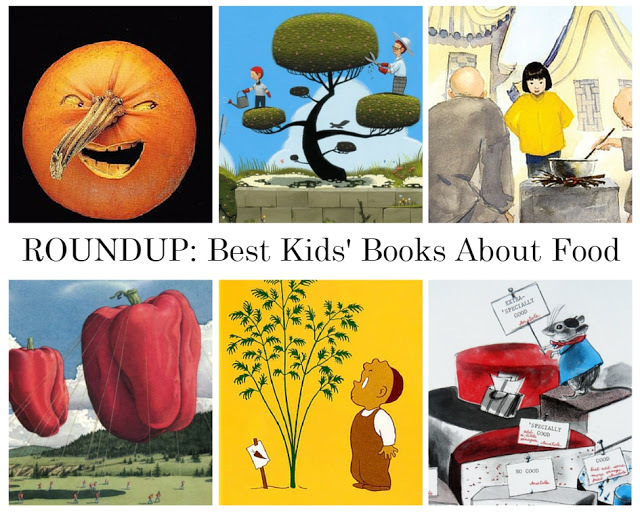 * A pasta rolling machine (mine is a hand-cranked Imperia pasta machine ) but if you get really into it and want to skip the elbow grease, KitchenAid sells lots of great, motorized attachments . It looks fun and delicious! And it was nice to see a little bit of Naushon, too. I miss seeing you all- it has been LONG time! Great post! I love the pictures and the descriptions, you really do make it look easy. The suggestion about making the pasta dough in a cookie sheet is a great idea - you are so right, much easier to clean. I have also taken a class up at Ramekins - wish I lived closer to Sonoma to attend more often. I would love to take one of their cheese classes. Thanks Anita! It's been way too long. I hope all is going well with you guys. Wishing for a pasta roller. Your blog is looking most delicious lately. I miss your cooking! This looks great - and such an added bonus to include pine nuts, which are one of my favorite ingredients! 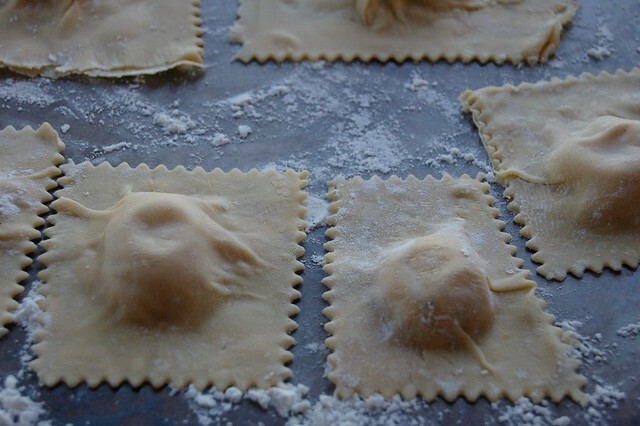 I often make fresh pasta, but I have yet to try my hand at ravioli. I think that will be my goal for next week. 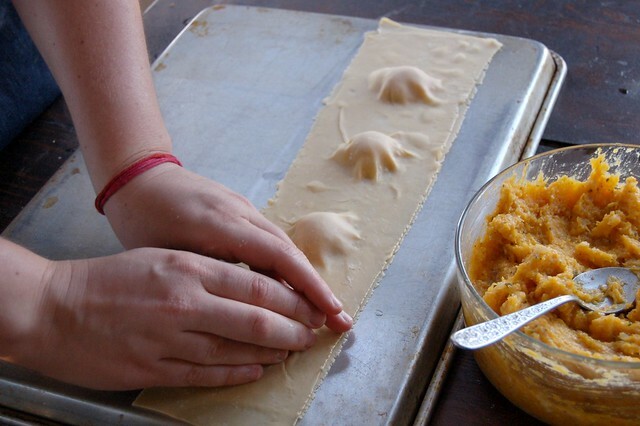 I thoroughly enjoyed reading your entry on making butternut squash ravioli. 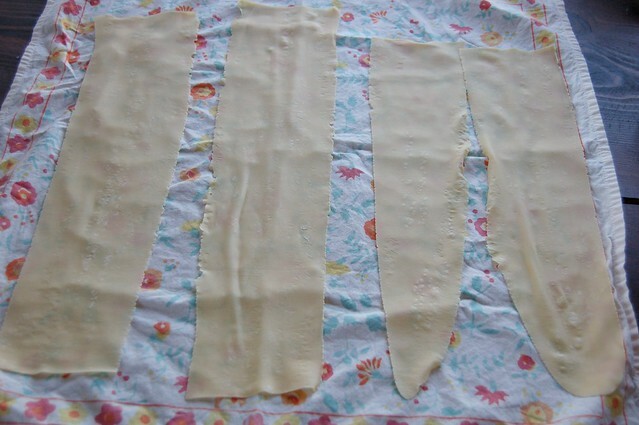 I came across your blog while looking for links on making pasta dough from scratch. 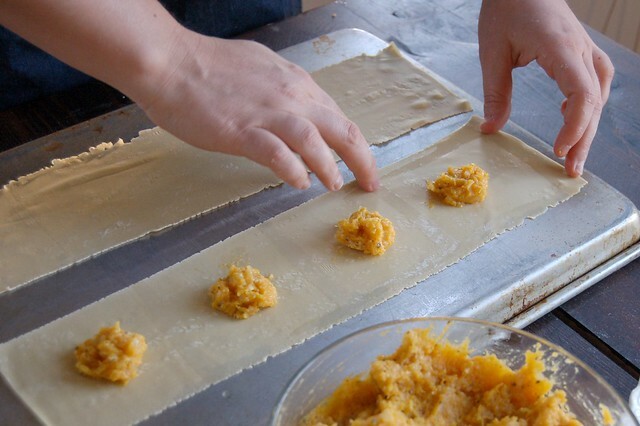 I planned on making butternut squash ravioli sometime this week, since it's one of my favorite pasta dishes and I love anything with brown butter, so I thought I might give the recipe an attempt tonight. However, I don't have a pasta rolling machine, so this means I'll be facing the reputed challenge of rolling out and flattening the dough by hand. 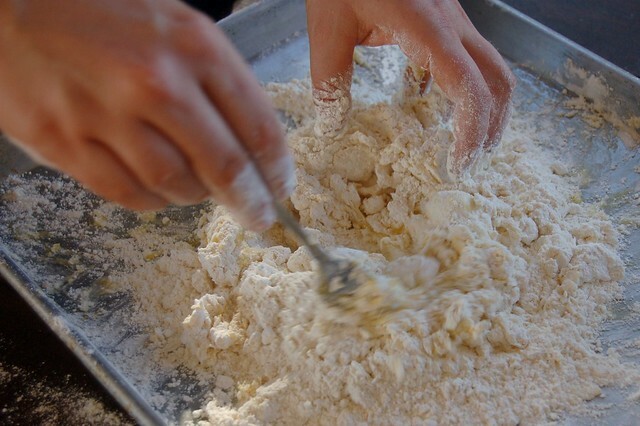 If you have any advice on the following questions: How hard is it to make the dough by hand the entire way? Should I put this recipe on hold until I can purchase a pasta machine? 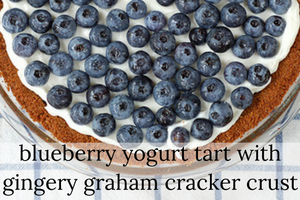 I made this recipe today! I own no pasta maker, so I rolled it all by hand, and it wasn't too difficult, just time consuming. I made sure to let the dough rest for an hour so it was easier to work with. I also doubled the recipe, and it made 28 raviolis, or 4 servings of 7. However, I could only eat 4 in one sitting! These are filling! To make a sauce, I heated up a skillets and used some leftover filling, added a 1/4 stick of butter, a handful of chopped mushrooms, and soymilk. 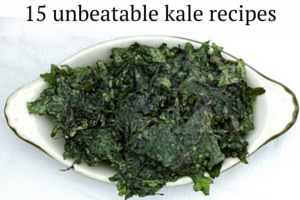 Thank you for this delicious recipe! This looks absolutely delicious! 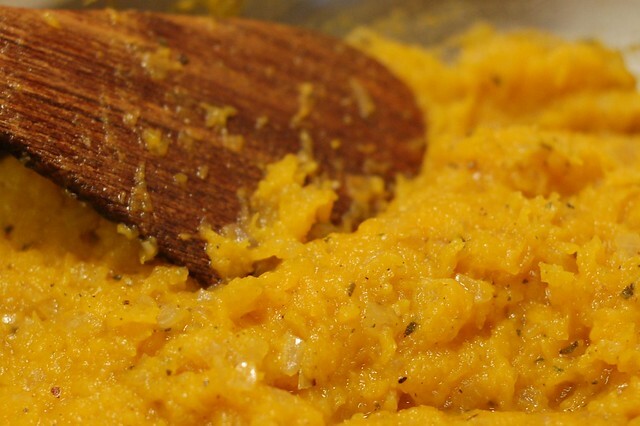 I love anything with Butternut Squash. How long does it usually take you to make this? I love your pictures that show how you make it. They are super helpful. I will definitely have to put it in my Future Dinner list. Thanks! thanks! They're really fun to make and very tasty. Definitely also a pretty time-consuming project. I suggest making the filling ahead of time so that you can focus on the pasta which will take you a couple of hours, most likely. And definitely something that is more fun and quicker to do with a friend or two. Looks fantastic!! 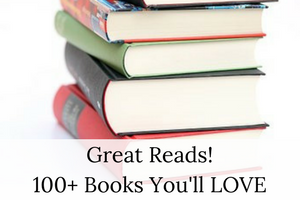 I am bookmarking. 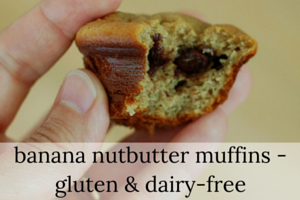 Thanks for sharing this recipe with me!!! Thanks! This was really delicious! I used whisked egg whites to sill the ravioli instead of water on not a one broke. Loved all the picture! This was my first time making noodles and your blog was incredibly helpful.